Nelson Mandela would have turned 100 this year on July 18 (Mandela Day). To honour Madiba, as he was affectionately known, 67 Blankets for Nelson Mandela Day aims to bring people together, striving to make the world a better place for everyone — one stitch at a time. 67 Blankets is a global non-profit initiative to knit or crochet colorful blankets for the less fortunate that started in South Africa shortly after Nelson Mandela’s death in December 2013. Zelda la Grange, long time Personal Assistant to the former South African president and global peace icon, presented her friend Carolyn Steyn with the challenge of making 67 blankets by Nelson Mandela Day in 2014 (July 18th). As a result, 67 Blankets for Nelson Mandela Day was formed which grew into a global movement. Wick is the former leader of the Anti-Apartheid Movement in Germany (ABB). She will talk about her encounters with Nelson Mandela, the worldwide movement to free Mandela and the struggles to end the racial apartheid system in South Africa. “As a freedom fighter, prisoner and politician – Nelson Mandela remained, until his death, faithful to ideals of antiracism, justice and peace,” she says. Mandela was invited to Bonn by Nobel peace laureate and former German chancellor Willy Brandt (SPD). 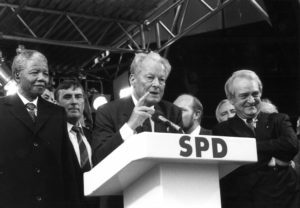 As the then president of the Socialist International, Brandt hosted a reception for him on June 11, 1990, where Mandela was enthusiastically welcomed by thousands of people. In the Mandela Centennial year, Bonns Fünfte Secondary School is launching a school exchange program with the Ndyebo Senior Secondary, a township school in Port Elizabeth. A school delegation visited the new partner school in South Africa this spring. A group of students and teachers from Port Elizabeth want to return the visit next fall. Bonn Fünfte students started a crowd fundraising campaign to help their peers pay for the trip. Bonns Fünfte also joined the 67 Blankets initiative to raise awareness and continue Mandela long Walk to Freedom. The school community aims to give the teachers and students from the Rainbow Nation a warm welcome with a colorful rainbow made of blankets and scarves. “We invite schools and people of all ages and backgrounds to participate in this collective 67 Blankets project and to get creative. They can draw their inspiration from Mandela’s life and work, the United Nations’ 17 sustainable development goals (SDGs) or the colors of the rainbow. Mandela, after the end of apartheid reinvented South Africa as a rainbow nation,” says Fricke, who works as an eurythmy and arts instructor. The goal is to make at least 67 blankets and scarves before winter and distribute them to local charities on December 5th, the fifth anniversary of Nelson Mandela’s passing. The first blankets and scarves made will be displayed on July 21 at a Mandela100 summer fest at the Rudolf-Steiner-Haus during a local #WalkTogether Action Week (July 18-25). The project will also be presented at the Bonn Camp (Aug. 3 – 10) of the Bonn youth movement along with a colorful arts tepee to highlight community and youth-led initiatives and solutions to stop global warming and advance gender equity and social justice. Conceived by German artist Ute Lennartz-Lembeck, the so-called gender tepee is a collective project aimed at building bridges through arts and global collaboration. There are actually about 20 of these tepees, hand-knitted by thousands of people around the world. One is located in Alego, the home village of Barack Obama’s father. The tent was brought to Kenya by his half-sister Auma Obama, who has studied in Germany and is founder of the Sauti Kuu Foundation. Sauti Kuu means “strong voices” in Swahili. About Mandela Day: Every year on 18 July — the day Nelson Mandela was born — the UN asks individuals around the world to mark Nelson Mandela International Day (18 July) by spending at least 67 minutes of their time to make a difference in their communities. For 67 years Nelson Mandela devoted his life to the service of humanity — as a human rights lawyer, a prisoner of conscience, an international peacemaker and the first democratically elected president of a free South Africa. Mandela Day is an occasion for everyone to take action and inspire change.